State of this art performance was obtained on AlGaN/GaN HEMT grown on silicon (111) substrate by molecular beam epitaxy. 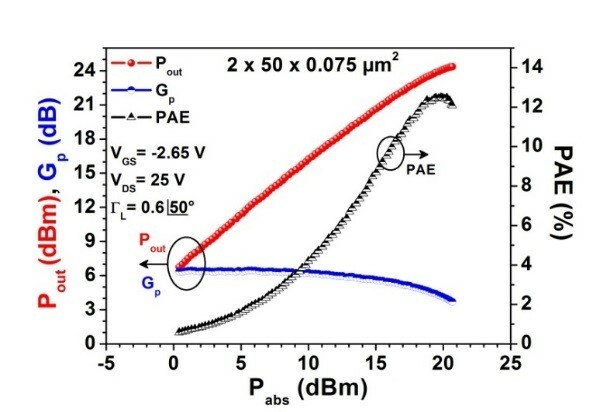 A maximum DC current density of 1.1 A.mm-1 and a peak extrinsic transconductance of 374mS.mm-1 are obtained for 75nm gate length device. At VDS=25V, continuous wave output power density of 2.7W.mm-1 is achieved at 40GHz associated with 12.5% power-added efficiency and a linear power gain of 6.5dB (Fig.3a). The device exhibits an intrinsic current gain cutoff frequency fT of 116GHz and a maximum oscillation frequency fmax of 150GHz . 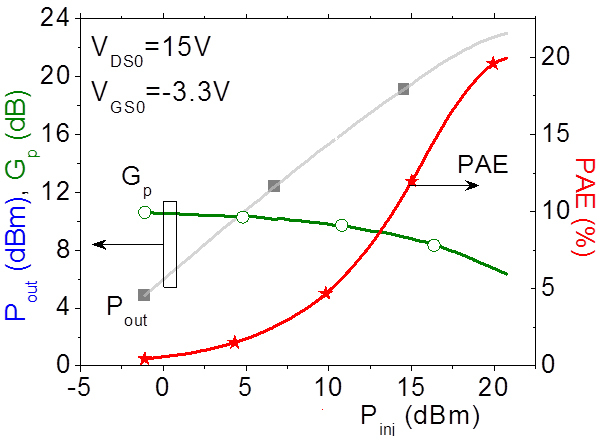 On silicon (110) substrate, maximum DC current density of 1.67 A.mm-1 and a peak extrinsic transconductance of 595mS.mm-1 are obtained for 60nm gate length device. At VDS=15V, continuous wave output power density of 3.3W.mm-1 is achieved at 40GHz associated with 20.1% power-added efficiency and a linear power gain of 10.6 (Fig.3b). The device exhibits an intrinsic current gain cutoff frequency fT of 108GHz and a maximum oscillation frequency fmax of 167GHz .